After giving Sunny Days two award-winning fillies, Contessa has delivered a beautiful colt, showing the same quality — chiseled features, long legs, springs in his feet and a genuine “look at me” presence. Sonnenfeld is sired by Sir Donnerhall (Sandro Hit / Donnerhall), who won his SPT in 2005 with as-yet-unequalled scores (over 165 points in Dressage), then became Bundeschampion and Reserve World Young Horse Champion in 2006. Contessa’s sire, Contendro, was himself SPT Champion scoring over 147 points, with highest marks in jumping, and top scores also in dressage. His offspring have included stallions and states premium mares, and they have won numerous jumping competitions, and earned top dollar at the Verden and Oldenburg and Schockemohle auctions. Contessa’s dam, SPS Ester, carries the blood of Champions Eiger I and Wenzel I, who have given us Olympians in Dressage and Jumping. 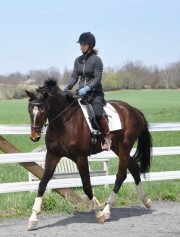 One would be hard pressed to find a better pedigree for athleticism, performance and riding horse quality. 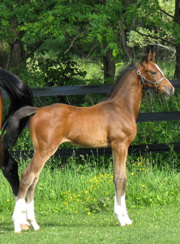 Sonnenfeld was SOLD to Shari from Maryland, and was chosen at his inspection, by Dr Christmann and Fritz Floto, as Champion Dressage Foal 2010. His phenomenal movement set him apart from a large field of beautiful foals, and his presence, type and good legs were also praised. Videos show Sonnenfeld at 1 month and six weeks old. Pictures are as a foal and as a 4 year old.